At Stray Possum Lodge we meet divers from around the world keen to explore the marine kingdom at our doorstep. 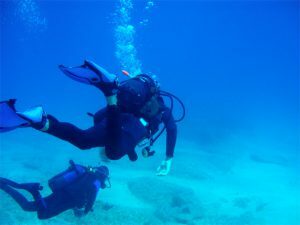 Visibility can be excellent especially in winter and a very diverse range of terrain is accessable to divers of all types. Scuba divers go in search of stunning underwater scenery to wonder at, caves and wrecks to explore and seafood to carry back to shore. Underwater photography can be rewarding and freedivers of all kinds fin their way round the coast, some to enjoy the sights and others, floating on the tide, await the appearance of large Kingfish or Snapper to challenge their marksmanship. The advent of GPS and fast boats has meant there is a lot more pressure on the Island’s fragile ecosystem and D.O.C has moves afoot to create a new marine reserve similar in principle to the famous Poor Knights resrve just North of Great Barrier Island but much larger. While arousing much controversy the reserve, if it goes ahead, should create a safe haven for many species of marine life and could prove to be a divers paradise. Meanwhile,whether you are a solo traveller with a mask and snorkel, or a diving club looking for a base on the Barrier, contact us and we can give you any advice you may require. Craig of Tryphena Charters is a really keen diver and can offer good advice Phone him on 09 429 0596, 027 329 5944,or Email tryphena.charters@xtra.co.nz. 09 429 0417 Monday to Saturday. 09 429 0488 in Whangaparapara. Safe diving! and if you’re looking for a place to relax with a meal and a drink after your day, come and see us at the Stray restaurant and bar. We’re about 800m from the wharf in Tryphena.